We all know art is to a great degree a matter of taste -- and the appreciation of it can vary widely from individual to individual. But even with all that leeway, not everything is art. Sometimes, the emperor is really just naked after all. millions of pictures. ENJOY THE GATES! I will be uploading my photos from the past three days of visiting NYC and seeing/photographing the Gates all three days, though not as many shots as I might have liked due to camera battery issues, but amongst my shots there are a few I'm proud up - will upload them to Flickr and share links to them here. Overall a very amazing experience - in no small part due to the thousands, probably millions over the past few weeks, of people visiting them. Even today, amidst the snow and ice the park was full, cameras were everywhere, and business throughout NYC was showing the effects - hotels were full, restaurants packed, vendors in and around the park doing well - the zoo packed, lines around the block for the MoMa, even the Guggenheim in the midst of tearing down an exhibition (so having more then 50% of the museaum closed) was packed. 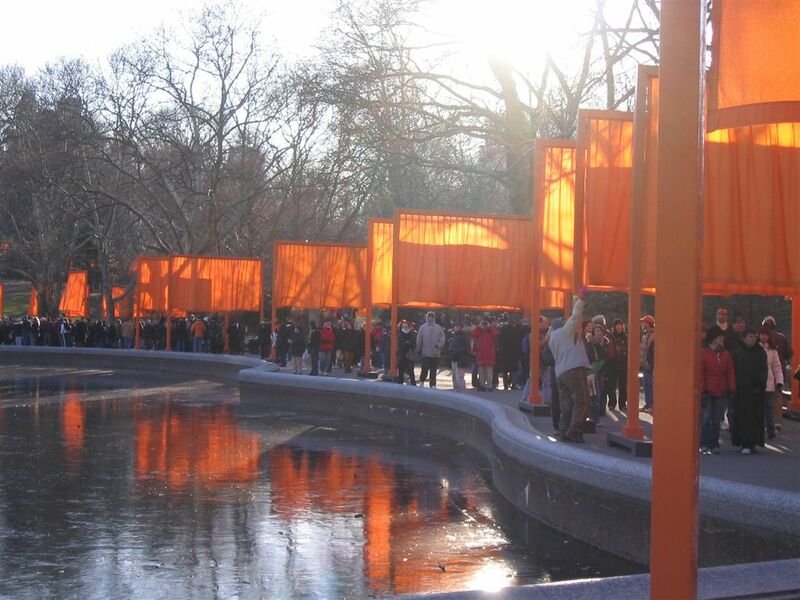 The gates themselves initially do not seem like much, each, individually is orange - but over time, as the light and wind, and as you walk along and amidst the park and realize that each gate's position was carefully chosen and thought out - each part of the park is different yet beautiful, with vistas and images that reoccur throughout the park, yet differ as well. If you are lucky, as we were, and get to a section of the park full of gates, but relatively empty of people, you can hear the gates flapping in the wind. 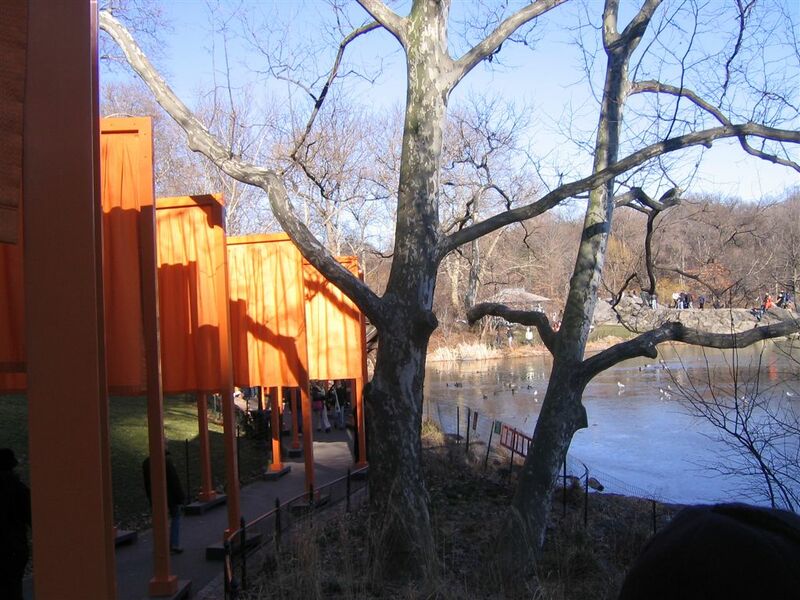 When the sun was out and the sky clear, the gates are each slightly transparent, and full of shadows, shadows of other gates, of trees, of park objects, fences, even people at a distance. The gates themselves are also getting incorporated into the life of the park - from children playing on the stands, leaving behind collections of pine cones or a lost mitten, to dogs marking their territory. They are for this month at least, part of the life of the city - and people came from all over the world to view them. This photo was submitted by Michelle Nevius. Michelle, who offers private walking tours of Central Park, has posted video clips and photos on her website. 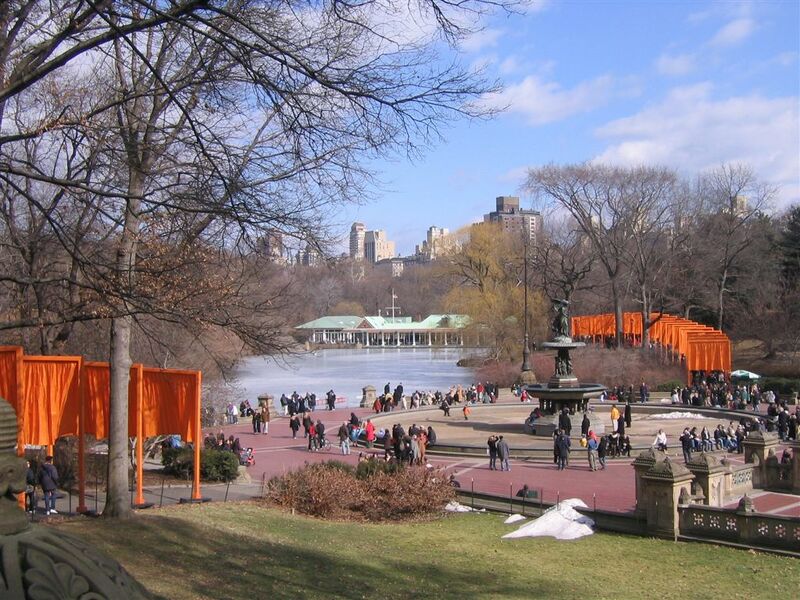 Rebecca Zimmerman reports on her visit to Central Park this weekend. "I had a very spiritually uplifting experience walking through Central Park," she said. "I felt like I was being surrounded by a constantly moving and shifting temple." "I loved to watch the curtains of the Gates flapping in the wind and the sun reflecting off them." 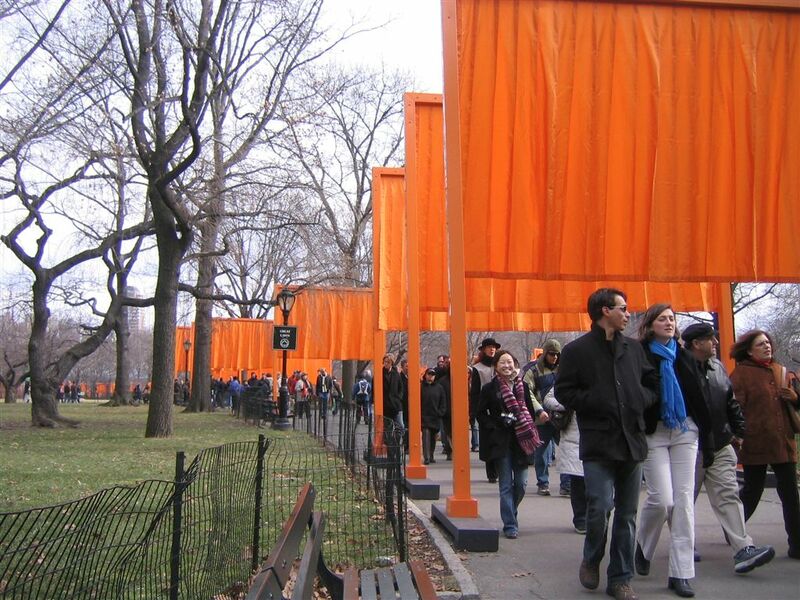 First lady Laura Bush was reportedly so taken with "The Gates," the epic project installed in New York's Central Park by artists Christo and Jeanne-Claude, that she has asked the pair to consider Crawford, TX, as the site of their next installation. The idea: wrap the Bush's 1600 acre ranch in eight miles of camouflage fabric. A series of photos from The Gates by Eric Carvin. The Gates, I believe it is all those things. in New York City already. 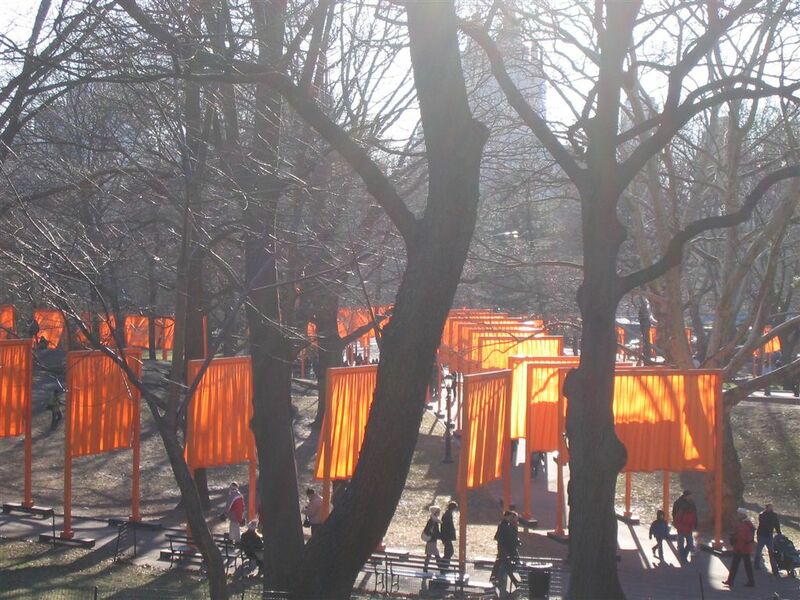 Mary Burns says that she feels The Gates is "a bit underwhelming." She then thinks about Frederick Law Olmstead, designer of the park, and his goal of achieving "a public space where different types of people can interact." 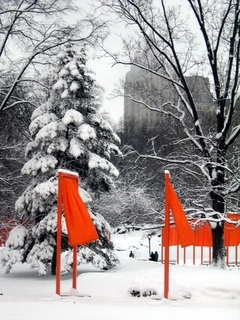 "in that sense," she concludes, "I think the Christo exhibit really achieve its goal, and it's quite a spectacle." 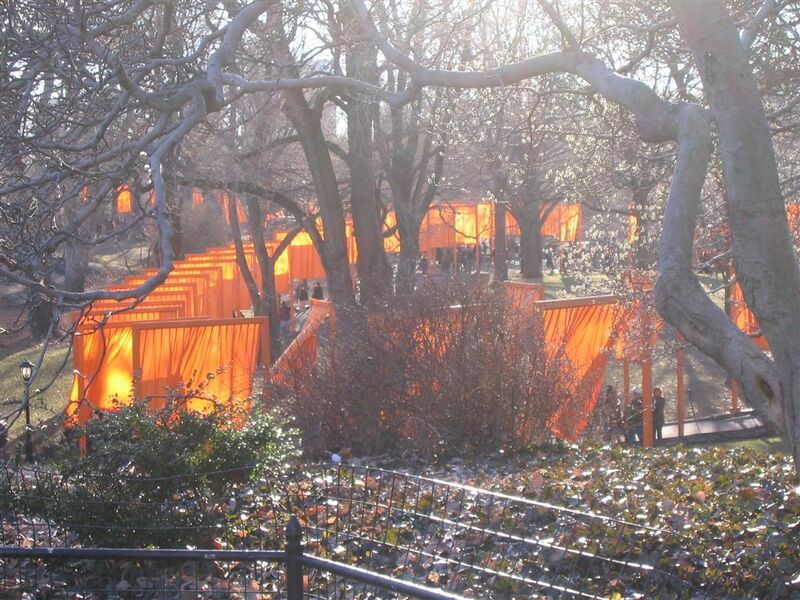 Here's a resounding yes-vote for your blogger site on Christo and Jeanne-Claude's The Gates, Central Park 1979-2005. My sister-in-law and I wandered the Park yesterday (2-17) for two+ hours, and the installation is delightful! 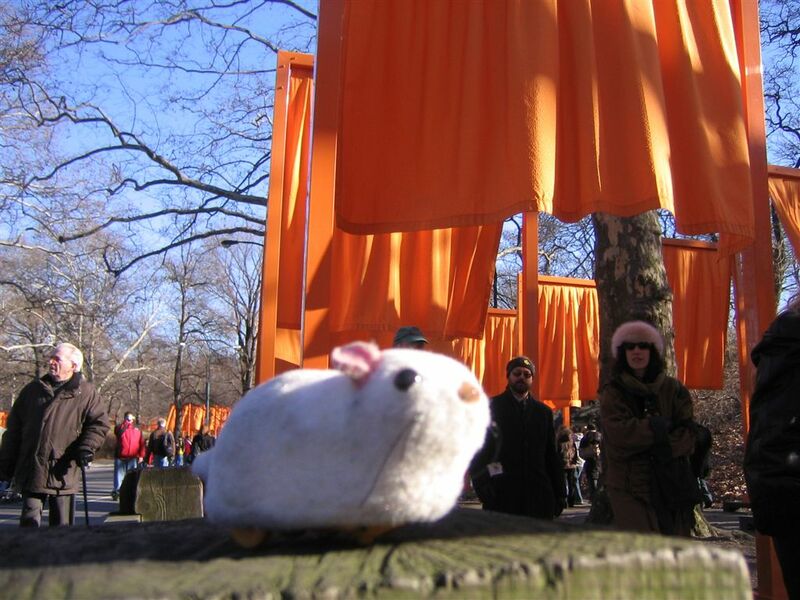 We started at Columbus Circle and walked up along the 6th Ave thru-street (stopping to climb rocks and bridges) to the Carousel, rode the flying horses, went on up to Bethesda Fountain, and returned past the bandshell to CC via the Hecksher ball fields. We decided the central motif was change: changing aspects, changing colors, changing sounds, all ephemeral. There was little sun, but with a glint the curtains turned a bright translucent orange in the gray landscape; sometimes they hung still in a vista of drapes and sometimes they flapped smartly in a breeze. In one place, we seemed to be covered in them; in another (looking back) they suddenly went marching off in different directions. And above all, they create a social context-dozens of people were walking through the Gates, all with cameras, and we were talking to each other and taking each other's picture by the time we got a few yards inside the park. In the rain the day before, one group said, all the puddles reflected the orange of the curtains, so they were walking through mirror-images. For people yet to visit: It is helpful to bring a park map (e.g. Flashmaps).